The VbDC course for youngsters who are interested in volleyball, and may have tried it once or twice, but just as likely have never played it. It is taught in short, energy-filled sessions commensurate with their ability to focus on drills fundamental to developing ball control. Fun is key to the course, but as a sugar coating to the mechanical repetition of basic ball-handling skills.VbDC recognizes that though repetitive, closed-ended drilling for the creation of “muscle memory” may be crucial to learning, it can become boring for the very young.The playful atmosphere is thus intended to fos- ter enthusiasm for the sport while the first building blocks to proficiency are laid down. Coaches affiliated and qualified with Volleyball England or the American Volleyball Coaches Association use innovative drills from around the world to help young athletes start a rewarding participation in recreational volleyball.The training opens the possibility to play competitive volleyball as they approach the teen years. 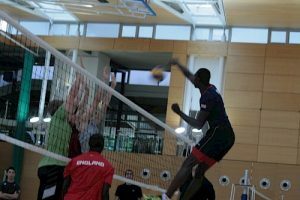 The satisfaction of advancing from beginner to intermediate player is considerable; but volleyball is not an easy sport to learn. Progress and success depend on regular training, which builds balance, speed, agility, stamina, acceleration and explosive strength. Pathways, the second VbDC Skills Level course, moves athletes into more organized, concentration-dependent drills.The Pathways athlete will have played recreational volleyball in PE class, church or club socials and may have just started or would like to try competitive, rules-based volleyball. This is a broad catchment, so athletes tend to be divided into two groups, depending on their experience.Those not sufficiently familiar with the rules or basic skills of the recreational game receive training in those areas to improve their knowledge and ball-handling, and make the sport more fulfilling.Those who have started competitive play are introduced to the purpose of three-touch volleyball and the improvement of their ability to engage in that form of the game. Drills require an increased ability to focus.The necessity for cooperation and communication with teammates is introduced, as well as positional responsibility and court coverage.Although the main emphasis is on defense and effective passing, the training begins to take on the first appearance of preparation for true attacking volleyball, and indeed some of the drills introduced at this level are almost the same as those used by elite players. Between the ages of 13 and 16, an athlete is likely to have decided whether volleyball is going to be their number one sport or a seasonal activity. In either deci- sion, and dependent on the amount of time put into their training, it is inevitable that he or she will still require help in refining their ball-handling skills.The Skillz Weekend gives the athlete their first introduction to regimented training sessions that demand not just physical fitness and increased coordination, but also men- tal awareness of the game situation, an ability to think for themselves, the capacity to contribute effectively to the team, and the willingness to work with a coach. It is a curriculum that recognizes that the athlete’s body is beginning to take on more adult characteristics and can therefore accommodate more rigorous drills. But it is the most important muscle in the human body – the one between the ears – that begins to receive an increasing amount of attention. two or more skills to be used in association with one or two partners; they will start the process of incorporating tactics into their drills, and they will begin understanding that the game begins well before taking the court. Consequently, it is a physically demanding camp and therefore limited to two days in recognition that 10 hard hours of basic training in serving, passing, attacking and blocking are going to be as much as most athletes this age will be able to take in one dose. The curriculum continues at the Skillz Plus Camp, but with double the hours. Skillz Plus is a transition to week-long sessions where the dominance of individual ball-handling drills yields to team-based, open-ended training. Here VbDC campers can first earn recognition as potential “elite” athletes. At this camp athletes have their first extended encounter with team-based training, as the majority of drills are based on open-ended game simulation.The in- tense training is for the athlete who has made the commitment to participate in volleyball year round, probably as their number one sport.The athlete has played competitive volleyball sporadically or on a seasonal basis, and now is moving into the sport as being their pre-eminent recreational activity. Originally created for athletes who had been playing year-round club ball and were ready to move into adult competition, this camp became identified as also meeting the needs of athletes in international schools’ varsity programs, especially those considering participation outside the school season.Though few are contemplating national league-level competition, their skillsets nevertheless warrant a team-based curriculum to help them play more effectively for their school. Junior club players who have several years of year-round training find that the experience of working under a different coach with an international background introduces them to new styles of team play and tactics, and widens their understanding of the game.All participants are required to provide their club or school coach’s recommendations for areas of improvement. A residential option with 24/7 chaperoning and evening activities is available. After establishing a positional role with their club team, an athlete might be identified by their coach as exhibiting exceptional ability; they are candidates for the highest level of training, and possibly worthy of a try out for their national team. However, they have not actually been introduced to the demands of elite training. This camp is where that happens; indeed, some athletes use it as preparation for try-outs. Physically, the training is perhaps the most intensive of all VbDC camps, and participants must be in top condition to participate and learn. Mental toughness is re- quired: athletes are immersed in the individual’s positional role in creating an efficient and effective team; they are put under stress situations in which their ability to perform must be close to flawless, and where their capacity to outwit the opposition is fundamental to winning the point.The athlete is pushed to the limit of their ability, to test whether they are, as their coach suspects, material for the highest level of competition. The athletes who attend this camp are admitted by invitation only.Any athlete may apply, but an independent body will select the participants, normally 12 male and 12 female (plus stand-bys) based on their playing history and performance, and on the position they have played as members of their national team, a top division national league team, at university, or as participants at a national team training camp. Coach recommendation is required, as are videos and an essay. As established elite athletes, participants will find both the physical and mental training to be at the intense levels at which they normally train, but perhaps with greater emphasis on helping them refine their technical skills further; at this level, of competition even minute levels of performance fine tuning can make the difference between victory and defeat. As VbDC has grown, new programs have been added to its activities. One is the annual English Language/Volleyball Camp, detailed on page 6. Another service is the bespoke camp, organized at the request of a university, school or club for a weekend or a week. Normally they are not listed on the VbDC calendar of events, as they are conducted outside the posted schedule and may be open only to athletes from the sponsoring organization. However, some are open to the public, so it is worthwhile enquiring about them if any of the normally scheduled events do not happen when an athlete is available. 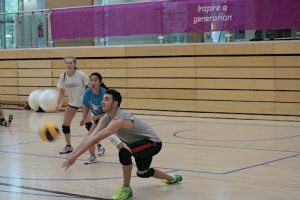 Among the specialist camps is one called Eight Simple Rules, which is designed for adults who play recreational volleyball. Using basic principles – eight, as the title suggests – this weekend (or multiple evening) course can help the mature player immediately realize an improvement to their game, resulting in greater satis- faction from playing a better form of volleyball without the need for many hours of intense training.You won’t become an Olympian, but you’ll enjoy the game a whole lot more. New to the VbDC agenda, and therefore not included in this brochure, is a series of one-day workshops being planned for 2018. Usually set for a six-hour session with a lunch break, these will be led by athletes who have established a reputation as an outstanding positional player, for example a setter.They will be assisted by Volleyball England or FIVB coaches in the planning of the curriculum.Visit theVbDC website to see what workshops are scheduled: www.vbdc.co.uk.